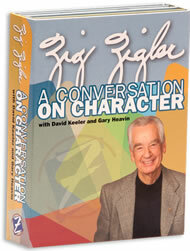 In this unique format, Zig Ziglar shares his thoughts in a casual and informal style that offers unscripted responses to questions that address many of the characteristics essential to professional and personal success. Facilitated by interviewers Gary Heavin, Founder and CEO of Curves International, Inc., and David Keeler, President of Cornerstone America, both of whom know the importance of character, having led their respective companies through phenomenal growth. Together, these men share the belief that integrity is essential for true success. Honesty: Honesty is a trust-builder that is critical to progress in society. Truth can be denied but it cannot be avoided. Team Player: Individuals score points. Teams—at home, on the job, in athletics, government, etc.—win games. Team players understand that if they accept their responsibility and deliver on schedule the team will be able to perform on schedule and everyone wins. Discipline: Discipline is fueled by commitment and a balanced goals program. It’s true that when you do the things you need to do when you need to do them, the day will come when you can do the things you want to do when you want to do them. Goals: If you don’t plan your time and direction, others will take your time and direct your life for their benefit. Goal-setting is bringing the future into the present so you can do something about it now. Responsibility: When you accept your responsibility and consistently deliver, you attract favorable attention from friends, family, and upper management. It’s a step ladder to steadily moving up—and taking others with you. Attitude: William James stated that the most important discovery of our time is that we can alter our lives by altering our attitude. Studies at both Harvard and Stanford reveal that 85% of the reason we get a job and make progress in that job is because of our attitude. Passion: Directed passion founded on an ethical, moral base enables each individual to utilize his or her full potential. The results can be awesome. With positive, controllable, energizing passion, your life will be enormously enriched and those in your realm of influence will be lifted higher and taken further than they ever dreamed possible. Self-Worth: Dr. Joyce Brothers said, “You cannot consistently perform in a manner which is inconsistent with the way you see yourself.” Consider this: If a man can take moldy bread and make penicillin out of it, just imagine what a loving God can make out of you. Love: Responsibility, talent and commitment enable us to do things well. Add love to the formula—love for our job, love for our project, and love for the people for whom we are performing—and we will do them beautifully. Love brings our heart into full focus and we become like the high jumper who broke the world’s record when he threw his heart over the bar and the rest of him followed.